Music for Easter: Dvorak's Stabat Mater - one of the most powerful declarations of faith in musical history. Antonin Dvorak's Stabat Mater has to be one of the most beautiful and most moving pieces of music ever to come out of the Czech lands. The text is a devotional poem written in Latin in the 13th century, probably by the Franciscan monk Jacopone da Todi. It opens with the grief of the Virgin Mary at Christ's crucifixion, but then turns into a prayer, written in the first person and addressed to the Virgin - in which the writer longs to be reunited with Christ. The poem ends with the hope of the resurrection. The poetry is powerful in its very simplicity. "At the cross her station keeping, / Mary stood in sorrow weeping / When her Son was crucified." Dvorak was among many composers, including Palestrina, Haydn, Mozart, Schubert, Rossini and Poulenc, to put the Stabat Mater to music, but his version stands out with its extraordinary spiritual intensity and emotional range, as well as a strongly symphonic quality. It is a huge work - when performed it usually lasts well over an hour - for orchestra, choir and soloists. For some insight into the spiritual impulses behind Dvorak's Stabat Mater, you do not have to delve far into the composer's biography. 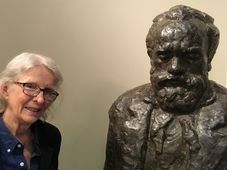 He began work on the piece in 1875, when his joy at his first successes as a composer and his happy family life, were shattered by personal tragedy. 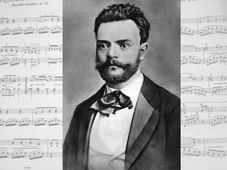 His daughter Josefa died at just two days old, and as a man with deep religious beliefs, Dvorak began work on the Stabat Mater as a way of coping with his grief. He soon had to put aside the work to deal with other commissions, but he returned to it after the family was struck another bitter blow. In August 1877 his 11-month-old daughter Ruzena accidentally drank a phosphorous solution and died. Less than a month later, tragedy struck yet again with the death of Dvorak's son Otakar. A household that had been filled with the sounds of children crying and laughing was empty - Antonin and his wife Anna were suddenly left completely childless. They were later to have further children, but at the time their sense of loss must have been huge. Dvorak immersed himself in his Stabat Mater, and two months later, on November 13th 1877, the work was complete. "When my body dies, grant that to my soul be given the glory of paradise." Then the orchestra comes back to accompany the choir for the final "Amen". This must be one of the most powerful declarations of faith in the history of music. The Stabat Mater was first performed in Prague on December 23rd 1880, and was an instant success. For an English-speaking audience it has a special importance. It was thanks to the Stabat Mater that Dvorak was first invited to England - which began his long and hugely fruitful bond with both Britain and the United States. But more of that another time.